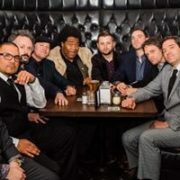 True Loves are an 8-piece instrumental Soul group out of Seattle, WA that got their start during the early spring of 2014 when drummer David McGraw, bassist Bryant Moore, and guitarist Jabrille “Jimmy James” Williams began jamming. The band expanded quickly, adding keys, horns, auxiliary percussion, and singer Grace Love, a heavy hitting vocalist with an uncanny ability to improvise song lyrics. Songs started flowing and soon thereafter the band was in Studio Litho recording their debut album, Grace Love & the True Loves. The album features such radio hits as Fire and Nobody Sweeter and was #19 on KEXPs Top 100 Albums of 2015. The group split with Love in August 2016 and was back in the studio in January of 2017 to record their debut instrumental album, Famous Last Words, which was released in July of the same year. The album features high-energy bangers and mid-tempo groovers that showcase what the band does best: playing in an unrelenting pocket. To promote the album release, the band headlined a sold-out TimberFest 2017 featuring the vocal talents of Daptone Records Saun & Starr. True Loves recently finished a sold-out two-night stint at Seattle’s Tractor Tavern in addition to completing their first East Coast tour, playing The Rosslyn Jazzfest and Rockwood Music Hall.